Along the coast between Bari and Brindisi are some fabulous beaches that are very popular in summer. In winter, they’re deserted, so Tom Weber, my other half, and I, armed with our cameras, have been visiting several of these to see how they’re faring at this time of year. Any of you who have visited these resorts in summer will be surprised to see how very different they are once the sun umbrellas and deckchairs have been packed away for the season. Restaurants and hotels, for the main part, close from October to April and holiday homeowners lock and shutter their houses before heading back to wherever they came from. Just look at Santa Sabina for starters! 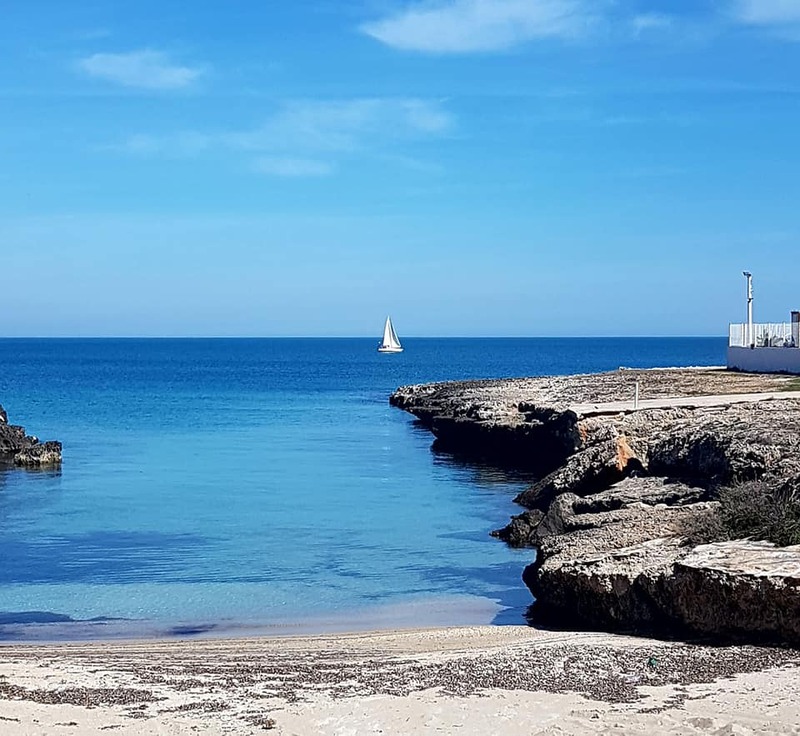 We’re lucky to live within easy reach of several beaches, as the White City of Ostuni overlooks the Adriatic Sea, about fifteen minutes drive away. Here in winter, the locals dress in dark, conservative clothing, complete with neatly knotted scarves, boots and gloves. It is easy to park downtown and the Centro Storico (historic centre) is eerily quiet. 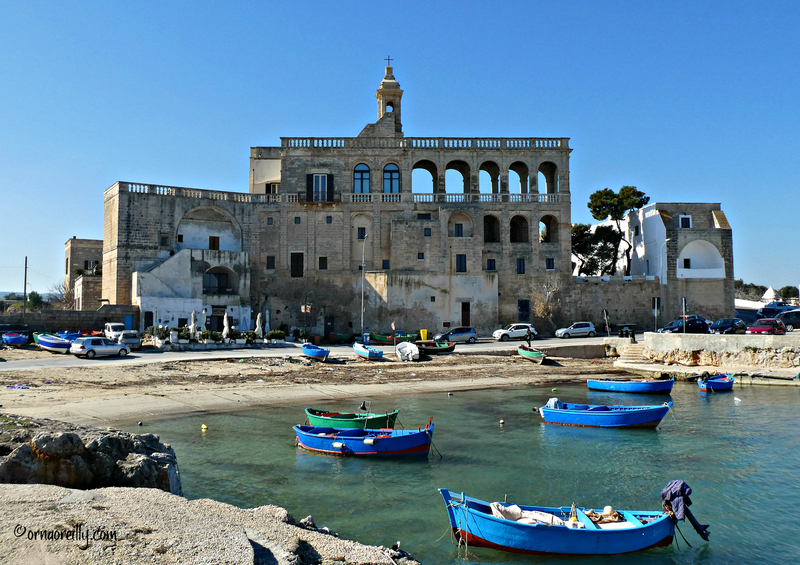 In summer, the local beaches are packed with holidaymakers and our local town of Ostuni is transformed as hundreds of thousands of visitors descend, mainly from northern Europe. In late June, the town is suddenly hit by an onslaught of fair-haired people sporting flimsy wraps and flip flops. On a routine visit to the supermarket, it is possible to be jostled at the vegetable weighing scales by large ladies in swimwear, while the deli counter turns into a virtual war zone and resumes its system of queuing by number. Starting from the most northerly of our favourite spots along the nearby coast, Cozze is an intriguing place. Anyone who has landed at Bari Airport and travelled south will have, perhaps, noticed an area covered in dilapidated trulli along the strada statale. We stopped there recently, drove up a back road and took lots of photos of these old buildings. These were a surprise to me initially as I thought these structures only existed in the Valle d’Itria, where we live. The beach in Cozze is, apparently, a busy place in summer with some interesting resorts which close for winter. Just south of Cozze is the Abbazia di San Vito. This enormous structure looms over the tiny fishing village of San Vito where there is a pretty watchtower and a few little restaurants. You will notice several watchtowers in the following photos, as they dot the Pugliese coastline. These were constructed in the 16th century when Emperor Charles V decided to take action against regular invasions from the East. From San Vito there is a view of Polignano a Mare, just to its south. Famous Polignano a Mare, where every year brave souls enter the Red Bull Cliff Diving championships and dive from the cliffs into the clear waters below. This town is often very crowded in summer, but is idyllic for a winter stroll. Savelletri is where we often head for Sunday lunch at any time of year. Our favourite restaurant there is Luna Rossa, where the fish is so fresh it is almost leaping off the plate. In winter, however, during the week the town is very quiet, with empty streets and shuttered houses. In summer, many wonderful restaurants pop up along the beach between there and Torre Canne. Torre Canne boasts a lovely, long lungomare and a lighthouse. Again, the beach in summer is busy. Pilone consists of a watchtower with two large beaches, one on either side. On our visit in February this year, there were men bravely swimming. I was impressed! Villanova and its port, Porto di Villanova, are closest to Ostuni. My favourite walk is south along the walking/cycling path from Villanova. I usually walk as far as Gorgognolo, where there is a huge red house on the promontory, which always whets my curiosity. I believe it belongs to some noble family from up north, but it seems shrouded in mystery to me and I have never seen anyone there, though it’s all locked up and the gardens appear to be well tended – as far as I can see from peering through the bushes. Costa Merlata is an easy walk south of Gorgognolo and there is a luxury resort there which looks very splendid. I have never been inside, but it is called Sole in Me. Torre Pozzelle is reached down a sandy track. 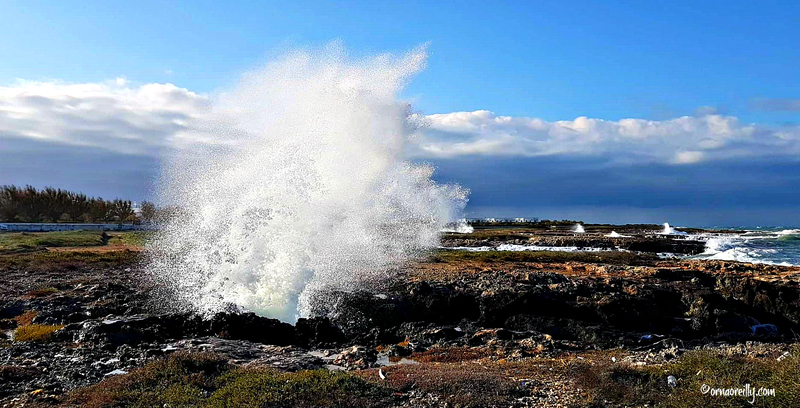 It is perched on top of the rocks and looks a bit dangerous and dilapidated up close. Lamaforca is just south of Torre Pozzelle and there is a fair sized beach there, just a five minute walk from the carpark. Walking further along the coast heading north, Torre Pozzelle is clearly visible and an easy walk. Santa Sabina, the furthest south my photographs will take us today, is below the town of Carovigno and is another favourite spot for Sunday lunch. Our favourite spot there is La Terrazza, for the terrific seafood. 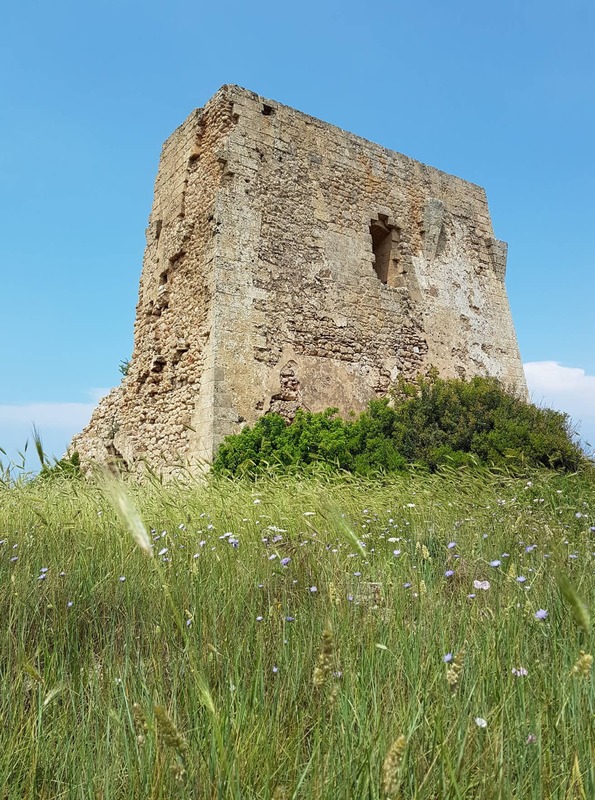 If you are staying in Ostuni and feel like venturing a little bit further south, there is the nature reserve of Torre Guaceto which takes in several beaches. Be prepared to walk! And, just a couple of minutes inland are the beautiful olive groves with their carpet of yellow flowers. How lucky are we! Brilliant, Orna. You covered our nearby coastline perfectly. Great shots, too. Thanks Tom. But didn’t we have great weather for our photography sessions! Puglia’s beaches are wonderfully unspoiled and winter is absolutely the best time for long walks in the fresh air. Where’s our next shoot going to be, I wonder? Thanks Lyn. There were quite a few manly swimmers about last week enjoying the winter sunshine. Delighted you are heading to the Sunshine Coast. Don’t forget, if you visit Guru Life, you can mention “Kate’s mum” as that’s my name when I visit. Nobody ever heard of Orna!! Love your people-less winter beach photos, but I’m partial to the empty beach, and I’m a little afraid of those large ladies in swimwear. Supermarket shopping is quite terrifying in the middle of the tourist season! I try to time things so that I don’t arrive just before lunch when the hungry, sunburned visitors arrive to stock up. I absolutely love it here in winter. Walking on deserted beaches and along all the little paths by the coast is my favourite thing. Glad you like the photos – it’s really just a photo blog this time. Senza much information! Wow! We travelled through Puglia last year and missed all the places you mention. What beauty we have missed! Thank you for the photos! What a tragedy! I can’t imagine how you missed out on all those gorgeous coastal towns. Hopefully you will come back for another visit and see them all. Glad you liked the photos. Thank you Ferdinando for your kind words. I’m glad you enjoyed the photographs of our lovely coast. 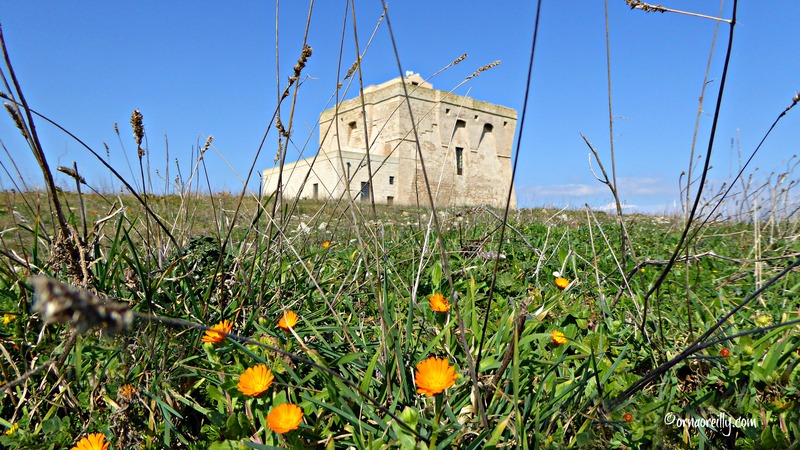 Yes indeed, we love Puglia and especially the area around Ostuni. It’s very beautiful and we feel very lucky to live here.